The last update was 6+ months ago and today I’ll be sharing with you the stats from the site during that time. I will also be talking about a huge milestone the website has achieved during these past 6 months since the last update. Overall, a lot of cool still will be talked about in this update and I’m excited for you all to read about it. Let’s get started! As mentioned in my previous posts, my parents and I split the monthly profit 50/50 but they were the ones who put up the initial $6,000 to purchase the website. I’m super excited to say that my parents have earned back their entire $6,000 upfront investment solely from 50% of the monthly profit. That means my parents made back their initial investment 15 months after purchase, which is REALLY good considering everything is split 50/50. The site as a whole was able to earn back the $6,000 within 9 months (not accounting for the splitting between my parents and I). As you can see, my parents alone have made close to $7,750 in monthly profit which is $1,750 above their initial investment. I’m pumped to be able to clear the initial investment for my parents. Even though they have made back their initial investment with the monthly cash flow, they will still get $6,000 off the top once we sell it. For example, of we sell for $30,000 then they will get $6k and then my parents and I will split the remaining $24k. 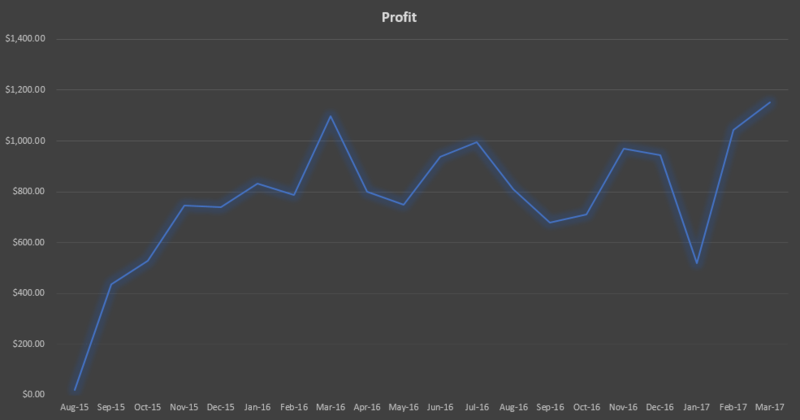 Let’s now take a look at the monthly profit numbers going all the way back to when we bought the website. The profit tends to go up and down each month but it stays within the $750 – $1,100 range most of the time. However, this last month (March) was the best month ever for the site with it clearing over $1,150. The previous high was way back in March of last year with just under $1,100. It’s interesting that my two most profitable months both came in the month of March. I think this is more of a coincidence than anything though. If you recall, last March the site had a post go viral on Facebook that drove an insane amount of traffic that really boosted the ad earnings for that month. This time around in March, there wasn’t any insane traffic boosts. Instead, I think I am getting a better understanding of the best way to monetize the site, which I will explain in a little bit. There was a big drop in January 2017 which was caused by some issues with my Google AdSense account. For over 3/4 of the month I had to use Media.net ads due to my account being disabled. To make a long story short, there was an issue on AdSenses side of things that was resolved and I was able to get my account back up and running for February. If it wasn’t for this, January would have probably been around the $800 – $900 profit mark. The site has generated close to $15.5k in profit since purchase and has averaged $774.80 per month in profit. Both very good numbers. The monthly average is skewed a little bit due to the vert first months profit (Aug 2015) being only $20. The last two months the site has made over $1,000 in profit and that is the benchmark I’m aiming for each month moving forward. One of the main themes that I have talked about since the first update is how reliant the website was on AdSense for its revenue. I fully understand that I’m not going to be able to fully diversify away from AdSesne but I would like to get to a point where if anything happened to AdSesnse that I would still be fine and not get completely wiped out. A perfect example of why this is important happened in January when my AdSense account was temporarily unavailable and in the entire month of January AdSense earned me $28. However, the site was still able to pull out over $500+ in profit for the month. Yes, my earnings took a large hit from where they usually are but I wasn’t at zero. The site still made a good chunk of profit and if for some reason AdSense was permanently disabled I would be able to still salvage the site. For the first 10 months 93.4% the site’s revenue was coming from ads but in the second 10 months that number was reduced down to 80.2%. Still a large chunk, but getting better! This reduction is mainly due to the emergence of the Shopify store starting to gain some traction. The store now accounts for close to 11% of the total revenue and my aim is to get this even higher in the coming months. The affiliate earnings even saw a small uptick as well. Let’s dig a bit deeper into these revenue sources so we can get a true picture of how diversified the revenue is. For example, the ad revenue is actually made up of multiple ad networks. Looking at the individual revenue streams gives a more accurate analysis because you’re normally not at risk of losing an entire revenue category (ads, affiliate, store, etc) but instead losing an individual revenue stream (AdSesnse, Amazon, etc). One thing that needs to be addressed are the earnings from Ezoic. Ezoic is an ad tester that allows you to hook up multiple ad accounts and they will automatically find the best performing ad types and positions. I mentioned in my last update that I was going to be testing them out and I have really liked it so far. However, the reason why the earnings need to be addressed is because the Ezoic earnings are a combination of AdSense, Media.net and other ad platform earnings. So even though I have made great strides in diversifying, it isn’t as diversified as it looks at first glance. Since November the store has been averaging close to $150 per month in revenue and even had a few months with over $220. These numbers aren’t anything crazy, but it does show some potential and it is always nice being able to add another revenue source. It’s worth mentioning that all of these sales are coming from one product too. Over half of the traffic is coming from the main menu link on the main site and converts well. However, I have found Pinterest to be the highest converting source of traffic. This is because Pinterest allows people to make purchases of a product without leaving Pinterest. This is huge and converts really well. In order to get this feature on products your pins need to be “Buyable Pins“. What’s the plan moving forward with the store? Now that the store is making decent money and the concept has been proven, I’m now going to double down on buying new products. I have already bought a handful of different products but they are hit or miss. I’m going to do some research and buy 5-10 new products and see how well they do on Pinterest. If they do well, then I know I have a winner and can reorder more of that product. If it falls flat then I can just move onto the next one. I don’t think the store will ever become the main source of revenue for this site, but I do think I can get it to a point where it is making $500/month in revenue consistently. That’s at least the goal for now, but things can easily change. The surge in the summer months is mainly due to the niche of the website, which lends itself better during that time. Overall, I would have liked to of had more growth but I can’t complain. Traffic has remained consistent month in and month out. Since the site relies so heavily on Pinterest for its traffic that even when the organic and other sources have growth it doesn’t have that large of an impact on the overall traffic. The organic traffic is growing, although a tad slow, but it is still growing. I haven’t been as consistent as I would have liked in terms of creating new content and that is a major reason for the slow growth here. Although I haven’t added very much new content, I have still been able to see progress just from basic on page SEO. Doing things such as creating better titles, meta descriptions, trying to rank for featured snippets and overall just trying to make the site more google friendly. I really want to buckle down and start creating new content for the site. I’ll be starting the hunt for a freelance writer or two and my hope is to create one new piece of content per week. I think the site has potential to do well organically but it is going to require me to branch off into sub-niches in order to reach new keywords. 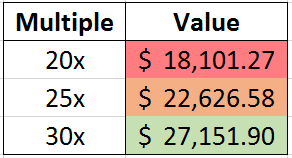 The above graphic shows a min, max and the average multiple I would expect for the site if I were to sell it today. Using a 25x multiple, which I think is about what I would expect for this site, it would be worth close to $23k. I really want to get this above $30k in value, which is going to require the site to be making $1,200/month in profit. I think this is easily doable over the next few months. The majority of the new content that has been created for this site so far has been geared towards ranking in Google. I am going to stop trying to go against the grain and start leveraging Pinterest more. What does this content look like? It’s going to be image heavy posts that target topics that are popular on Pinterest. This content more than likely isn’t going to rank in Google, but I’m optimistic that Pinterest can drive quick and long term traffic if done correctly. And that is what I’ll be going for. I have already hired a writer that will create this content and will let you know how this works out. I think there is a lot of potential here. I have doubled down on buying more products and I’m really interested in looking to scale the success that the store has seen so far. The cool thing about the store is that a lot of the sales are coming directly from Pinterest, which means the ad revenue doesn’t take a hit at all. There is no trade off between store revenue and ad revenue. I want to try and keep the site above the $1,000/month mark from here on out. The last few months have eclipsed this mark, but I want to make it a consistent milestone for the site. I think the store will play a large role in this. That is gonna bring us to the end of this update. Overall, the site is steadily growing each month and we are now 100% in profit from the site. I’m happy with the progress so far, but I am really looking to take it to the next level over the next 6 or so months and really see where this site can go. Thank you for reading and I once again apologize for the long delay between my posts. Stay tuned for more content coming soon. Josh, this sounds awesome. Maybe this has convinced your parents in doing more website investment projects with you. I like the approach to see the website business as a family business. Will do Bryan! 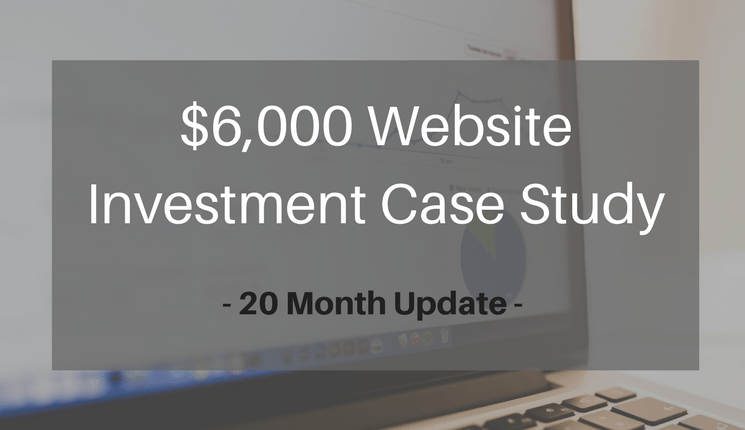 I actually have a similar case study running right now here – https://www.passionintopaychecks.com/website-flipping-part-3/ and a new update is coming out soon as well. Awesome update – I love the level of detail and sharing of what you’ve done. Keep up the good work! Great results! I wish I had so cool parents as you when I was younger hehe. I think the store has quite a bit of potential if you find the right products. Just finished reading Josh, great to see all the progress you have, especially with the store – would love to know the details but I know it’s not possible! I have been checking flip every day for interesting websites and I think I am able to spot the semi-interesting ones from the crap at this stage (of which there is ALOT). Don’t have enough money to invest in a decent one now though so I am looking at creating my own instead. Would be interested to hear your opinions on WordPress vs Wix or similar website builders. Thanks Daniel for the comment! Checking everyday and actually immersing yourself in all of the sites is the exact way that I learned. Even if you don’t have enough money now to buy the best ones, it is still worth seeing what is working vs. what isn’t and sharpening your eye for finding good sites. As for your question regarding website builders, I have always used wordpress and it is the best option out of all of the other similar ones out there. That is for many reasons, but the biggest in my opinion is how much you can extend the functionality via plugins. The majority of the sites you will find on Flippa (or other marketplaces) will more than likely be built on WordPress as well. So if you are looking to find one website builder and stick with it, I’d suggest WordPress by a mile. Hope that helps and thanks again for reading and commenting! I love this website and the articles are great but I’ve read them all. Does anyone know any other good websites that post case study type articles like this? That is really exciting to see the monthly profit figures and I like the way you are keeping track of the potential sale value. Not many people take that into account. Always feels great when you are working at creating a positive cashflow financial asset. how do you make those beautiful progress models to keep track of profits? Hi I am MIr Ashraf Ali. I want to start a niche site busness by invest. I have seen your riview on MarketEver.com . It,s CEO, Al-Amin Kabir. Can you suggest me is it batter for me ? and I am really inspire to read the post . just excellent . Best of luck . I want to do something like you . Thanks. It is very exciting what are you doing. I following your case and I’m ready to bay a website but I’m scared that I will do something wrong. Did you make a video how to bay a perspective websait? Thanks for all the info , insights and results! So nice to see young people so passionate about their work and helping others!